Purfling came first, this time. I decided that I would prefer to purfle first, then graduate, on this plate. 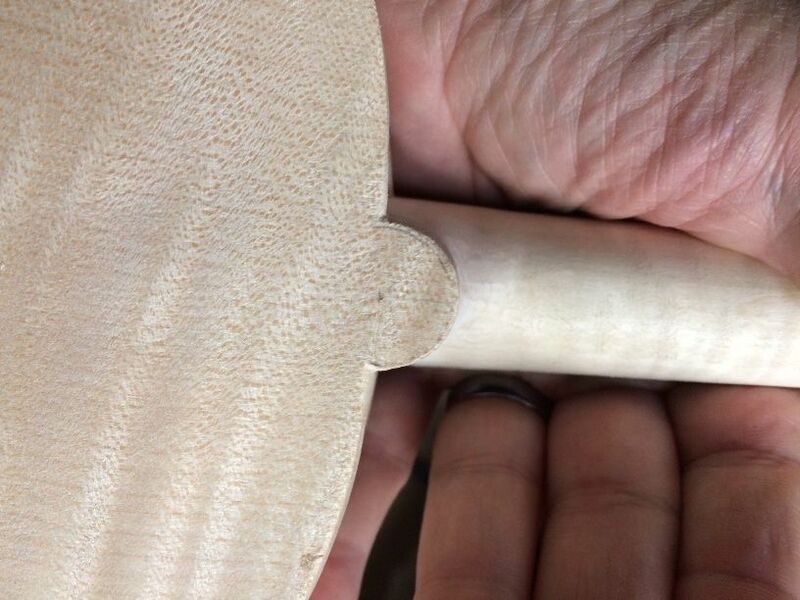 Maple is much tougher than spruce, and I wanted maximum mobility as I cut the purfling slot, as well as avoiding any danger to the rest of the indtrument when forcing the purfling into the glue-filled slot. It can require a great deal of pressure. 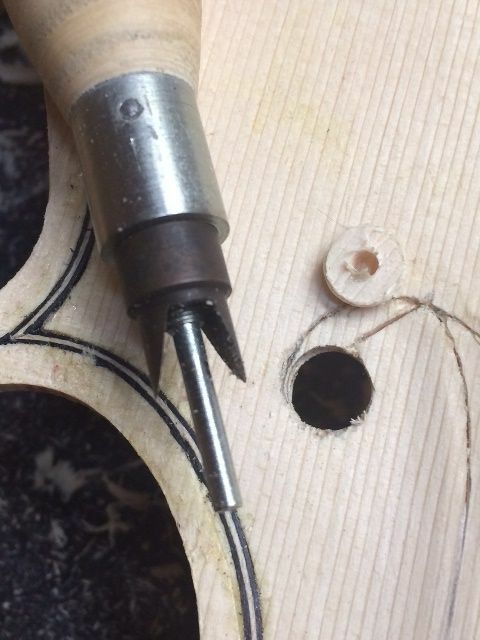 I used the purfling marker to trace out the location of the purfling slot. 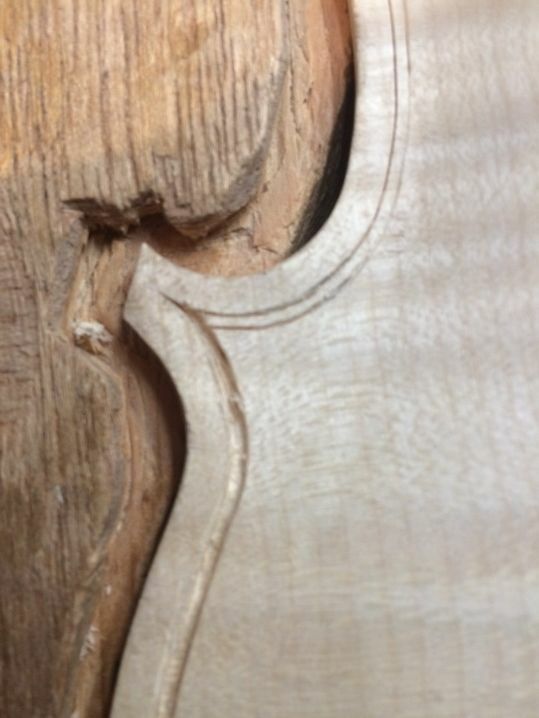 Then I began incising the sides of the slot, and removing the waste wood, with a purfling pick. 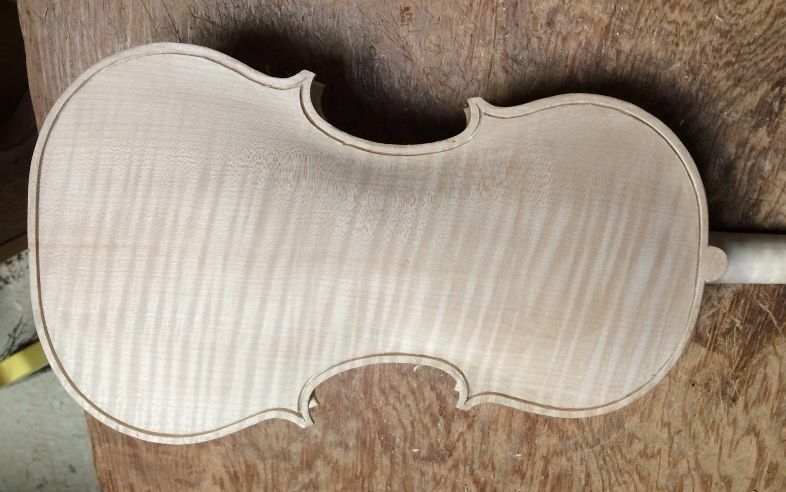 I always forget, between instruments, just how tough the European maple is. I always find that I have to take breaks once in a while, and allow my hands to rest. 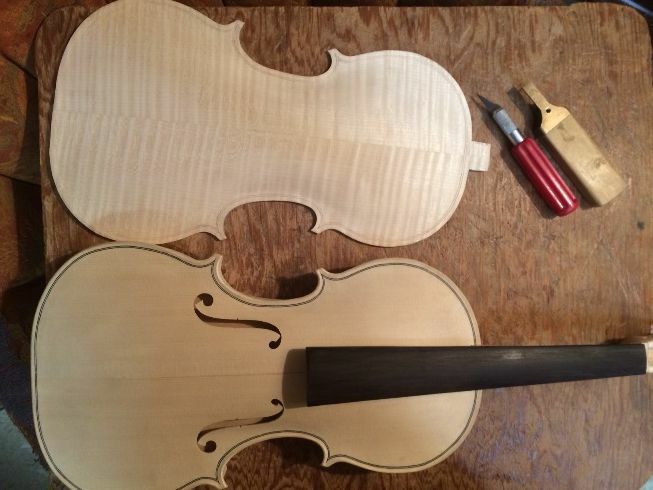 I always find the back purfling to be physically difficult, but it is easier to do clean work. 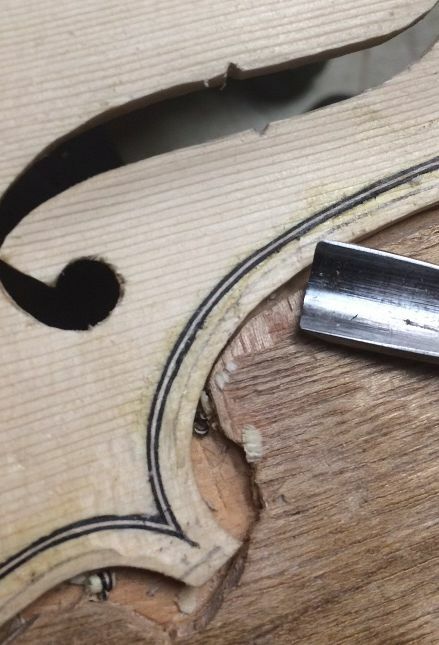 After cutting the slot and removing the waste wood, I double-check the width ans depth of the slot by inserting a scrap of purfling into the slot, and dragging it around the entire slot, so that I know the purfling will fit cleanly. Then I use a bending iron to bend the purfling, I cut the miters for the “Bee-stings”, and I insert the purfling, dry, to get a perfect fit. 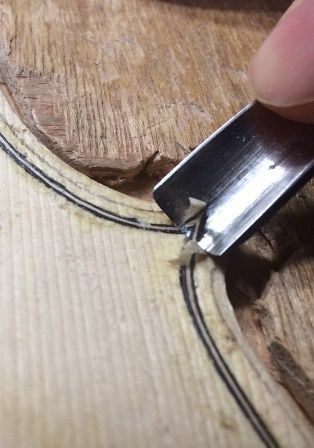 Before I start gluing, I also take time to mark the edge of what will be the “crest” of the edgework, so that I don’t gouge too deeply or too wide, when cutting the channel. 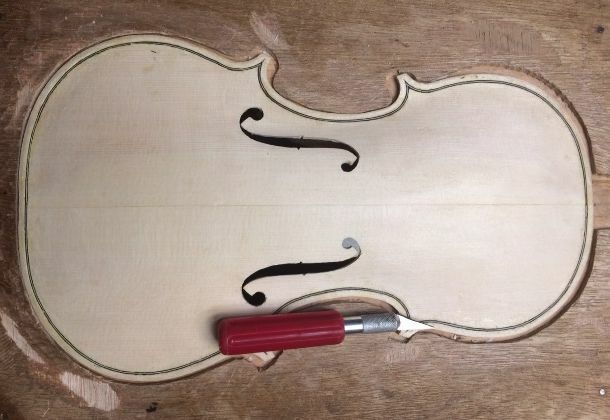 After gluing, it is difficult to get the pencil to mark on the wood, if it is either damp or glue-coated. If you look closely, you can see the pencilled-in crest marks. 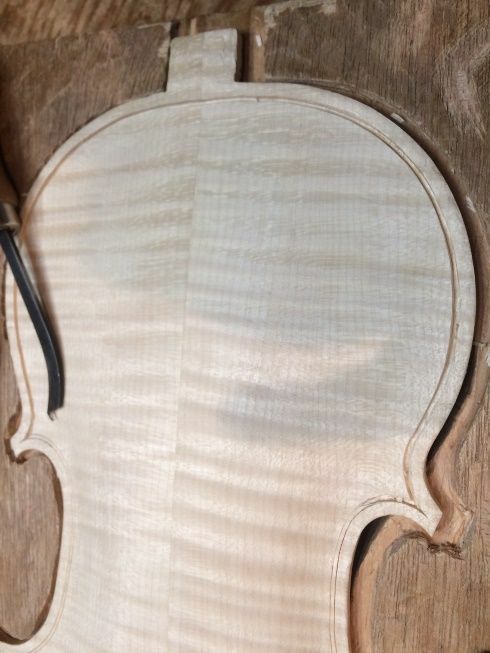 Finally, I lift out each purfling segment, one at a time, and slip hot hide glue under the purfling, then quickly press the purfling back down into the slot. I use a hard plastic roller to help force the purfling deeply into the slot. 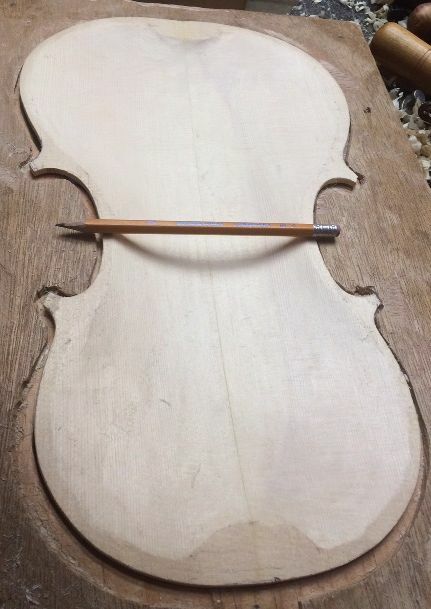 The purfling is glued in place, and I can cut the channel now. In this case, I chose to work on the graduation, next. I did not get it done, but I am within an hour of completion. Then I can conplete the plate, add the label, remove the mold, and close the corpus. 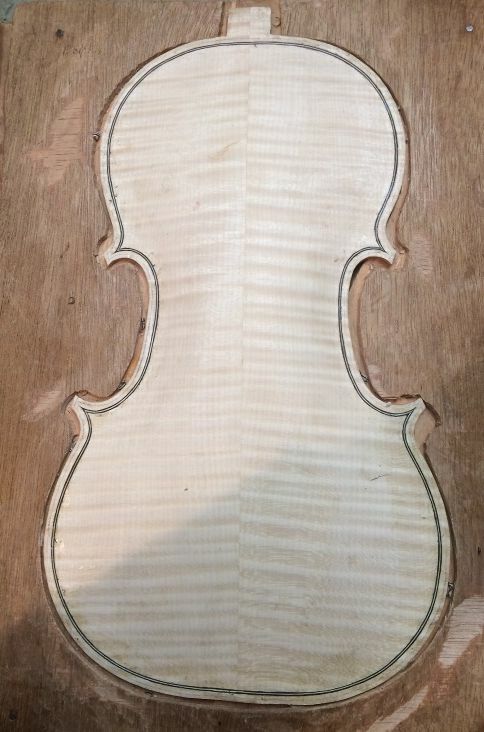 Back plate installed; button and heel not yet trimmed. Next, I will trim the button and heel, then add purfling, then scrape. These are the tools I will use. This is roughly the shape the button will be, but a little more refined, I hope. Side view of the heel and the button. The closeness of the camera warps the picture a little. 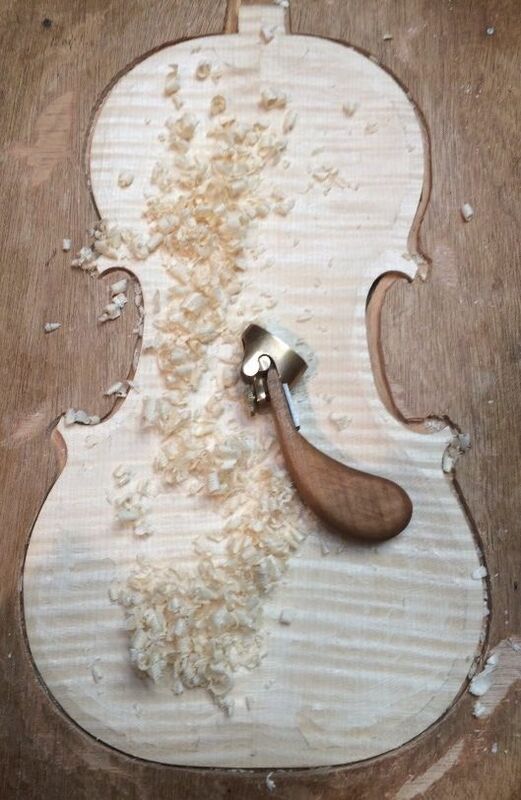 The next thing was to scribe in the purfling slot. I used the purfling marker to scribe the double line exactly 4mm from the outer perimeter of the plate, except the corners, where I used a sharp pencil to sketch the “bee-stings” in by hand. Then I incised the lines all the way around, just barely deepening the lines, so that they are more visible, and a little easier to follow with the blade of my small knife. 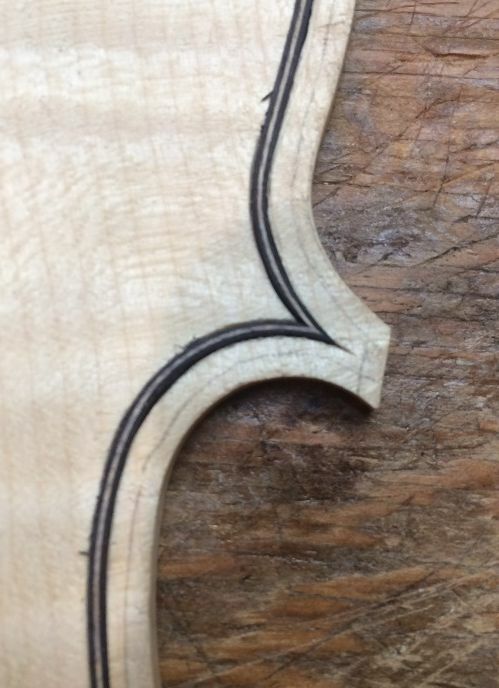 Purfling slot lines lightly incised. It looks good, but it is not deep enough. 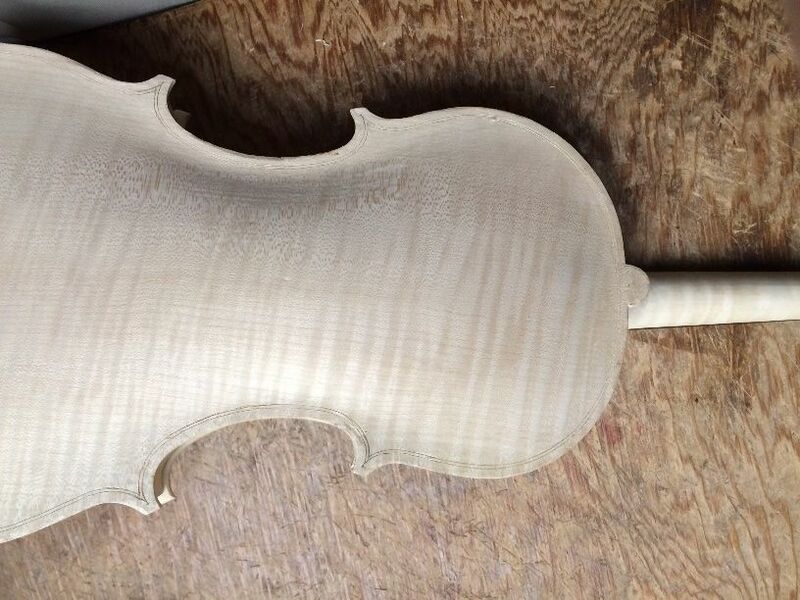 Purfling slot ready for purfling. 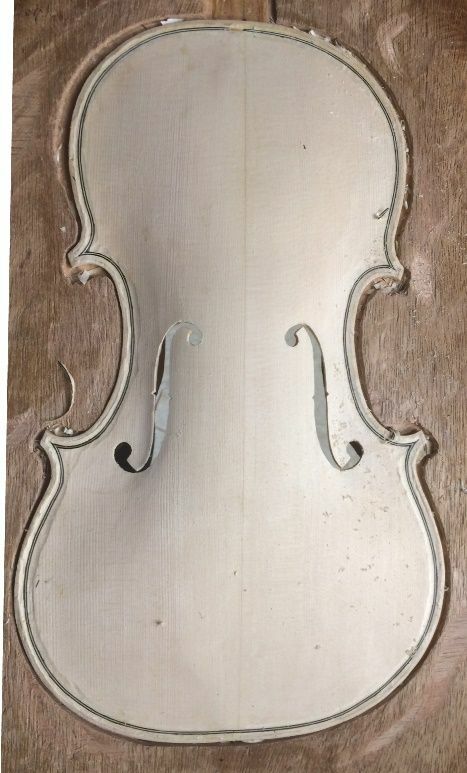 Tomorrow evening, then, I hope to complete the purfling channel and the outer edgework of both the front and back plates, and begin the final scraping in preparation for varnishing. Any little glitch, regardless of how tiny, will be very visible under the varnish. So this part has to be done with great care. The plate was still far too thick, but was at least looking encouraging…so I plunged in and brought the whole plate to approximately 3.5 millimeters thickness all over. This is the first time I have tried this graduation scheme. 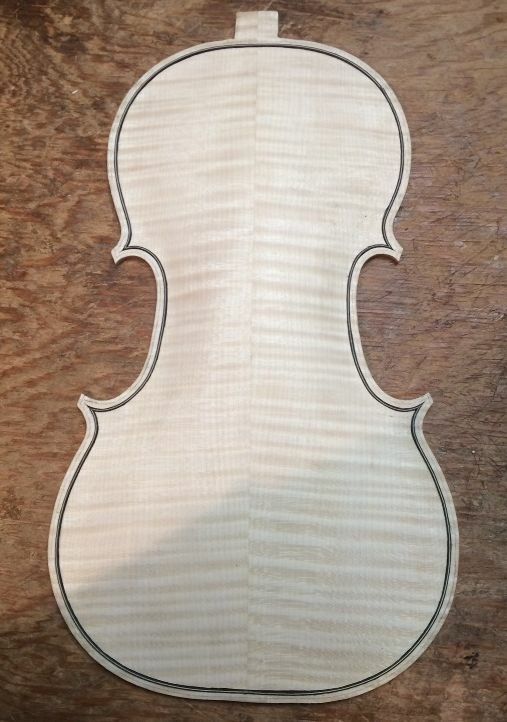 In the past I have been very particular to have one thickness in the center area, another, slightly thinner, above and below that area, and thinnest of all, out in the flanks. But, I am informed that that is not such a good plan. So…here we go! The pencil is only there to cast a shadow: otherwise it is difficult to see the curvature of the completed plate. After drilling the four f-hole “eyes,” I began cutting out the rest of the f-hole outlines, using a knife and a small saw. F-holes still need to be cleaned up…but there they are! 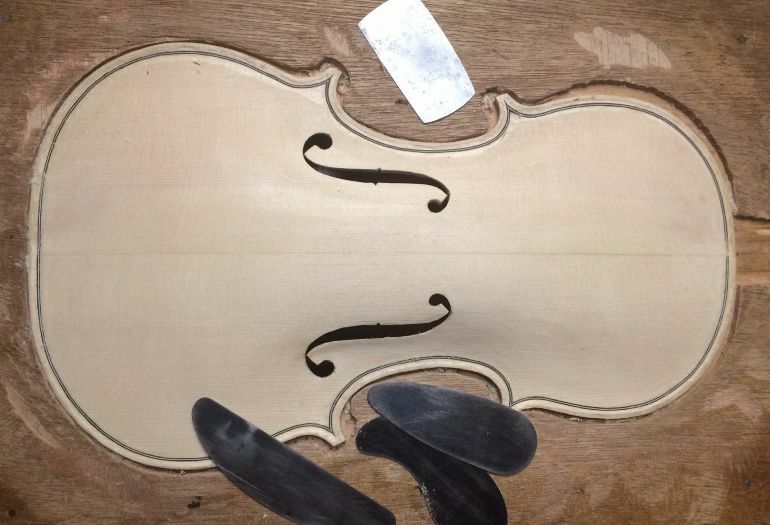 Now it is time to start cleaning up the purfling channel, and fairing-in the curves, up into the arching. I began with a sharp pencil, and drew an “edge-crest” line, approximately 40% of the distance in from the plate edge, toward the purfling. Then I used a sharp gouge to remove a shallow channel across the purfling, which ended at the edge-crest. 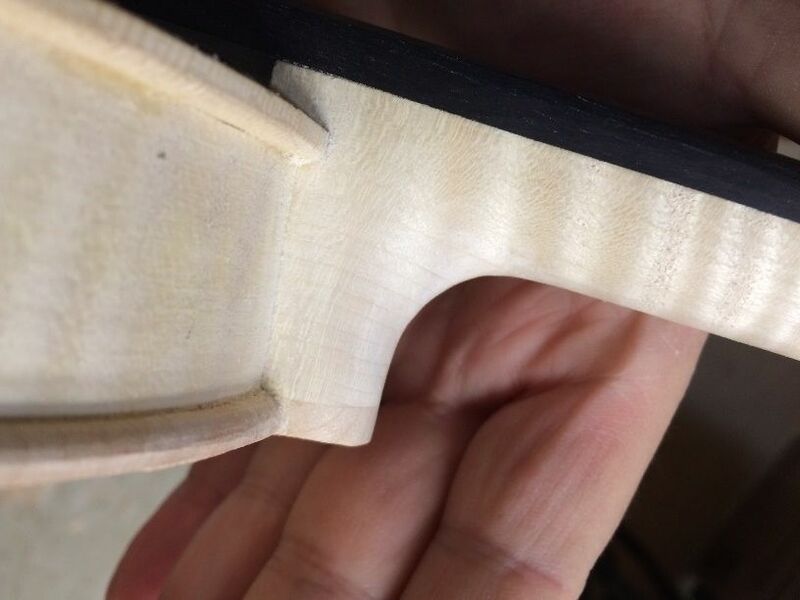 Then I used scrapers to smooth the transition between the edge of that channel and the arching curves. 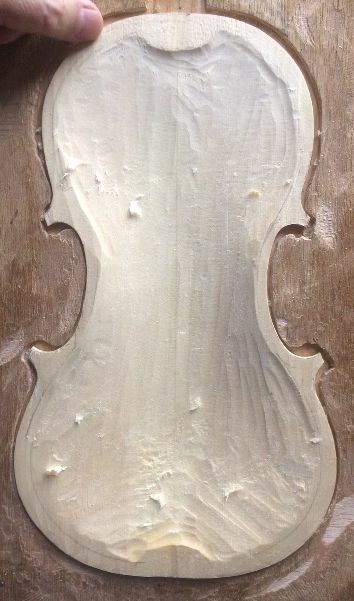 Edge-crest line, and gouge, beginning channel. Channel is cut: now scraping can begin. 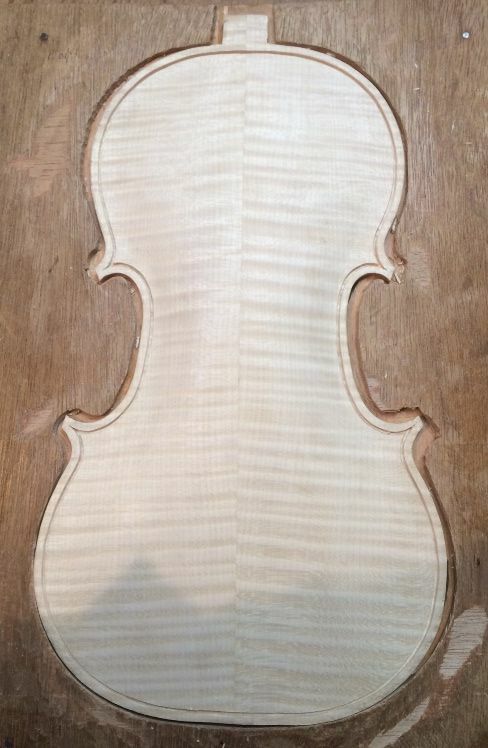 Treble-side scraping is nearly complete.